"It's the end, but the moment has been prepared for." And so all good things must come to an end. By this point it was now common knowledge that Tom Baker was leaving Doctor Who. Before he left though there were some other farewells to be said. 'Warrior's Gate' is the last story in the 'E-Space Trilogy' of stories. Here the Doctor, Romana, K9 and Adric find themselves at the Gateway, a void that leads between E-Space and the normal universe, or N-Space. While there they discover a race called the Tharils who are being treated as slaves because of their unusual abilities regarding time travel. The Doctor saves the Tharils but Romana and K9 opt to stay behind in E-Space to help the Tharils rather than return home. The Doctor and Adric leave without them and return to our universe, knowing that they will probably never see their friends again. However their's little time to mourn as the Doctor and Adric are immediately thrown into the events of 'The Keeper of Traken'. The Doctor is summoned by the mysterious Keeper to the peaceful world of Traken. Traken is an idyllic world protcted by the Source which basically means that no evil can occur on the planet. Unfortunately for Traken, the Master (still in his decayed form last seen in 'The Deadly Assassin' has managed to infiltrate Traken and wants to take control of the Source for himself. Needless to say, the Doctor and Adric stop the Master with help from a young Traken woman called Nyssa and her father Tremas but it comes at a price. After the Doctor and Adric depart, Tremas is attacked by the Master who takes over his body and begins to use it as his own. As the Master says: "A new body, at last." And so we come to the epic finale, Logopolis. Unknown to the Doctor, the Master has been reborn and is out for revenge. He sets a convoluted trap for the Doctor, which I'm not entirely clear on right now but it basically results in the Doctor being forced to visit Logopolis, a world of mathematicians who can create anything with their numbers. The Doctor unwittingly takes the Master with him to Logopolis along with a young Australian air stewardess called Tegan who stumbled accidentally into the TARDIS while it was on Earth. While on Logopolis, the Master tries to impose his own will on to the mathematicians and through them take control of the universe. Instead he accidentally triggers the end of everything which is a big blunder even by his standards. This results in the Doctor and the Master racing to Earth to find some way of halting the destruction. Meanwhile a mysterious figure called the Watcher has been, well, watching events unfold. He brings Nyssa from Traken to assist the Doctor and she discovers that, not only has the Master killed her father and taken over his body but his actions of Logopolis have destroyed her entire world as well. All in all not a good day for her. The Doctor meanwhile, with the Master's help, has managed to save the Universe from destruction but, in a final tussle with the Master he falls from a gantry and is fatally wounded. His life literally flashing before his eyes in the form of flashback clips, the Fourth Doctor regenerates, surrounded by Adric, Nyssa and Tegan. As for the Watcher, he merges with the regenerating Doctor causing Nyssa to remark, "He was the Doctor all the time!" To find out what happened next, viewers would have to wait until January 1982. So, for the first time in years there were no new Doctor Who episodes showing in the Autumn months. To counteract this, and to remind viewers that there was life before Tom Baker, John Nathan-Turner arranged for a series of repeats to be broadcast in the November of 1981. He chose one story per Doctor and they were broadcast under the umbrella title of 'The Five Faces of Doctor Who'. The stories chosen to be repeated were 'An Unearthly Child' for the First Doctor, 'The Krotons' for the Second, 'Carnival of Monsters' and 'The Three Doctors' for the Third and 'Logopolis' for the Fourth and (because he appears for a second at the end) Fifth Doctors. And that was pretty much it for Doctor Who on TV in 1981, except that is for 'K9 and Company' the first ever Doctor Who spin off TV show. It was also the last spin off show for many, many years. On paper the idea of teaming up popular former companions Sarah Jane Smith and K9 (now Mark 3) seemed like a great one. In reality it didn't work out quite as well, which is why this one-off Christmas Special didn't make it to a full series. I would say much more about it but I've discovered that the official Doctor Who You Tube Channel has recently uploaded the entire episode so you can see it for yourself and make your own minds up as to why it didn't work out. Whatever the reason though it did pave the way for far more successful spin-offs in the years to come. Over the years there have been a number of Doctor Who themed novelty records, some of which are more fondly remembered than others. 'Doctor..?' by a group called Blood Donor is one that seems to have been largely forgotten. I can't find much information on either the song or the group online and there are only two videos of the song on You Tube. It's a song that is very much of it's time and, it must be said, it's not particularly catchy so that might go someway to explaining it's relative obscurity. 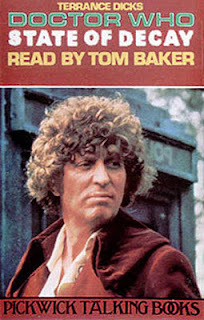 Also released in 1981 was a cassette that I have very fond memories of - Tom Baker reading an adaptation of 'State of Decay'. When I was very young I often used to get this tape out of the library. Not only was it a great story in its own right, but Tom Baker was the perfect narrator. He made the audio book sound a whole lot scarier than it appeared on TV, that's for sure. Only three novelisations were published in 1981. I'm not entirely clear as to why this is: perhaps Terrance Dicks wasn't available to write as many books as he he had been. Perhaps it was because there were now fewer stories to novelise - with the majority of the 3rd and 4th Doctor stories done - and Target didn't want to run out too soon. Quite possibly it was also because Target had chosen to spend their Doctor Who budget elsewhere, as they released several other non-fiction Who books this year. 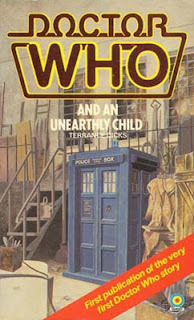 The three novelisations were 'The Creature from the Pit' by David Fisher, the writer of the TV story (the only 4th Doctor book published this year), Second Doctor adventure 'Enemy of the World' by Ian Marter and Terrance Dicks's novelisation of the very first story, 'An Unearthly Child'. Just to make it that extra-bit special the book was the first novelisation with the neon tubing logo and the logo was embossed in red foil!. 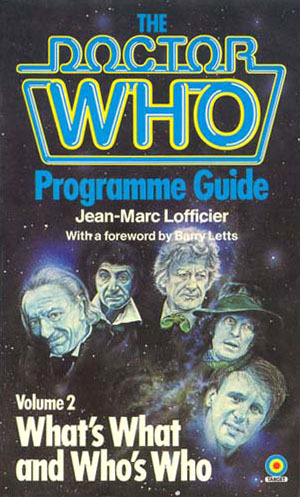 Those other books released by Target were the first Doctor Who Quiz Book (which pretty much speaks for itself) and the two-volume Doctor Who Programme Guide, written by Jean-Marc Lofficier. 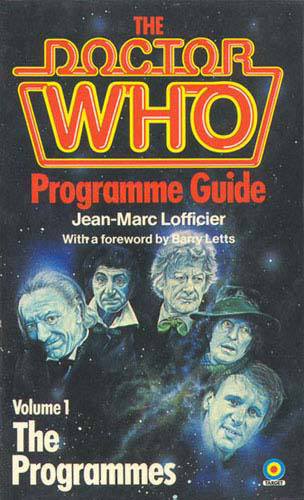 The Programme Guide was a first for Doctor Who. The first volume covered the TV stories produced to date, giving production and cast lists along with a brief synopsis of the stories. The second volume was an encyclopedia of sorts, listing characters, places, alien races and anything else you can think of in the Doctor Who universe. Neither book was without its errors or omissions but, for the time, they were the most comprehensive books on the TV series that you could want. Finally, at the end of the year, the traditional Annual was released with its usual mix of stories and strips. At this point in time, Peter Davison was close to making his full debut as the Doctor but, naturally it was the Fourth Doctor that dominated proceedings in the Annual. 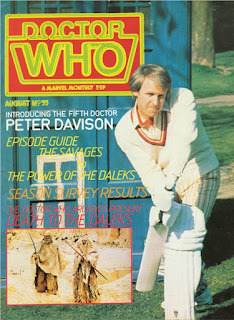 As a small concession though, the cover of the Annual featured a small picture of Peter Davision taken from All Creatures Great and Small. Doctor Who Monthly (as Doctor Who Weekly was now known) continued with its now usual mix of features and comic strips. With Tom Baker's departure, issue 51 was given over to a special 'Farewell Tom Baker' issue which included a look-back at his stories and a profile on the man himself. There was also an interview with the new Producer John Nathan Turner. With no new Doctor Who on TV screens for the rest of the year, the Monthly seemed to take this as an ideal opportunity to look back into the series's past. Issue 52 was a Jon Pertwee special, while issue 54 focussed on the Troughton era and 56 on the Hartnell years. Conversely, issue 55 was looking to the future with a couple of articles on Peter Davison with the man himself in costume for the first time on the cover. 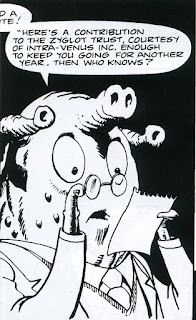 In the comic strip meanwhile, the Fourth Doctor was still the main man througout the year: the Fifth Doctor's comic strip debut would tie in with his first TV appearance in January 1982. Steve Moore was the writer for the first four issues of the year which sees the Doctor and K9 meeting Greek gods and visiting a library so big that it takes up an entire planet amongst other things. Regarding the library planet idea: I wonder if Steven Moffatt used to read DWM back in the early 80s as that idea is very similar to the Library that he created for 'Silence in the Library' in 2008. With K9's departure from the TV series, so he too disappeared from the comic strip, between stories and without any sort of fanfare. 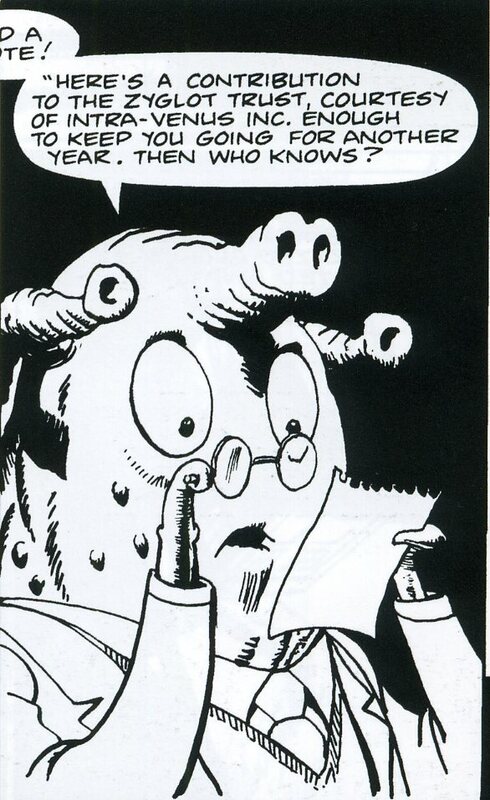 His departure coincides with a run of fairly dark tales for the strip. In part this may be down to the fact that a new writer had taken over the strip: Steve Parkhouse, a man who would guide the strip well into the Sixth Doctor's era. Amongst the strip stories published in the latter part of the year are 'The Deal' which sees a soldier using the TARDIS as a weapon to kill his enemies, causing an angry Doctor to lock the soldier out of the TARDIS and leave him to his fate which seems somewhat out of character. This is followed by 'End of the Line' which sees the Doctor helping a group of people to escape from a pollution-filled, cannibal infested city to the 'countryside', which the Doctor discovers is no better than the city. The story ends rather sadly with the Doctor realising that the people he helped probably never survived their escape from the city anyway. A slightly more light-hearted story is 'The Free-Fall Warriors' which sees the Doctor travel to the far future where he meets Doctor Ivan Asimoff and takes a trip with a group of stunt pilots called the Free-Fall Warriors. Doctor Asimoff - and you can probably guess which sci-fi writer he is named after - will return to the strip in the future.